Alright, here's the second and last instalment of MUFE's Aqua Liners, which claim to be waterproof and sweatproof. I daresay that these probably live up to their claim - removing them after swatching was a huge, huge pain. Apparently the entire Aqua line was developed for underwater ballerinas, too, so I guess if underwater ballerinas are using them, they have to work, right? 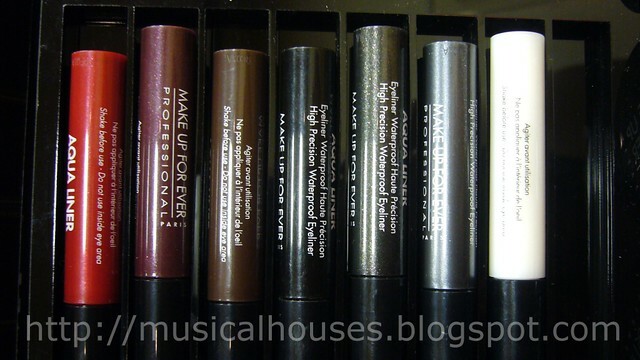 Anyway, here is the full range of the MUFE Aqua Liners. 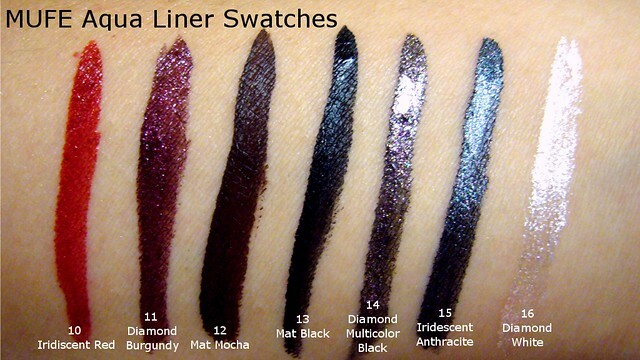 And these are the ones being swatched today. All of these are neutral and worksafe, except for one. 10 Iridescent Red is - well, a shimmery iridescent red. This is like, primary fire-engine red. 11 Diamond Burgundy is a deep reddish-purple shade with sparkle and shimmer. 12 Mat Mocha is one of the few creme shades with no shimmer or glitter, this is a pretty dark brown. 13 Mat Black is a deep black. No shimmer or sparkle. 14 Diamond Multicolour Black doesn't really look black to me (or at least not next to Mat Black anyway) - to me, because of all the shimmer and glitter this has, it looks more like a sparkly glittery almost-black grey. Pretty, this one is. 15 Iridescent Anthracite is a deep shimmery grey colour, and I'm not sure if I wouldn't think it was black when applied on the eyes. 16 Diamond White is a nice sparkly white. This one seemed to be somewhat sheerer than the rest - it's not white-out type of white. I'm thinking it would look AWESOME layered over another colour of liner. I adore 14 Diamond Multicolour Black - I'm a serial eye-rubber so these sound perfect for me! Not sure if I could pull off the red though..! I'm really interested in a liner that truly won't budge! I rub my eyes and have oily lids AND my eyes tend to water (when I yawn, when it's windy out, when it's really sunny out.. always). Oh myyyyyyyyyyyy~~ Mat Blak looks so diivine. And I really want the red one for some reason. I'm not sure why i'd line my eyes red...but I totally could.